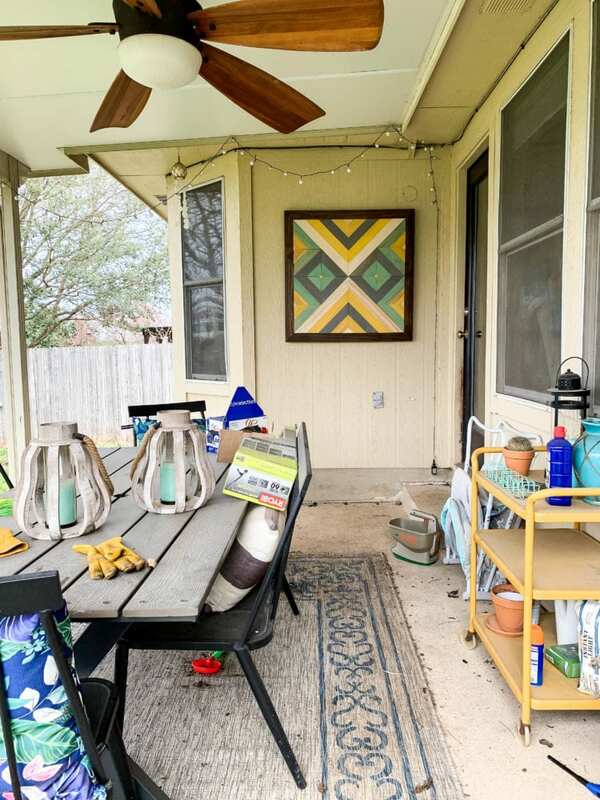 Today I’m sharing a few small steps I took to get our patio ready for spring, along with the one change I made that completely transformed the feel of the space (and I’m betting, how often we’ll use it!) with our new Enbrighten Cafe Lights and Landscape Lights! 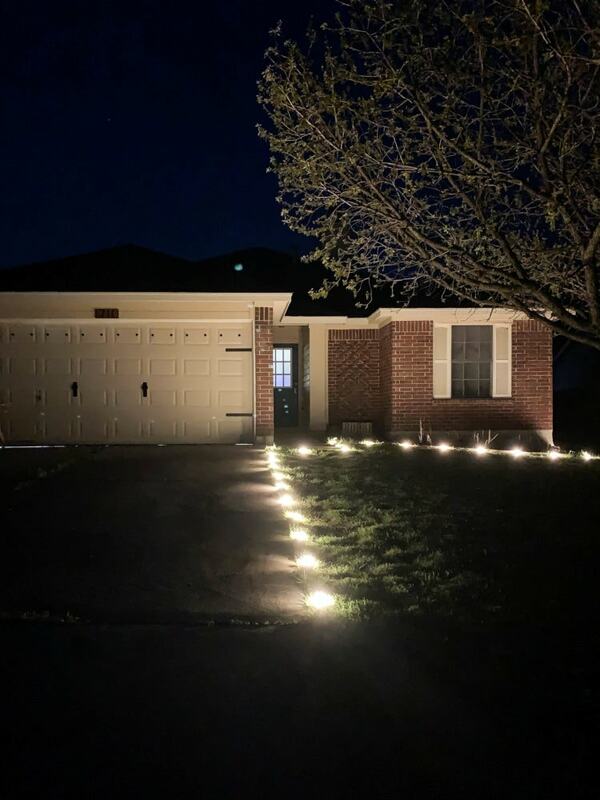 This post is sponsored by Enbrighten, but all opinions (and enthusiasm about outdoor lighting) are 100% mine! Thanks for supporting the brands that support Love & Renovations. 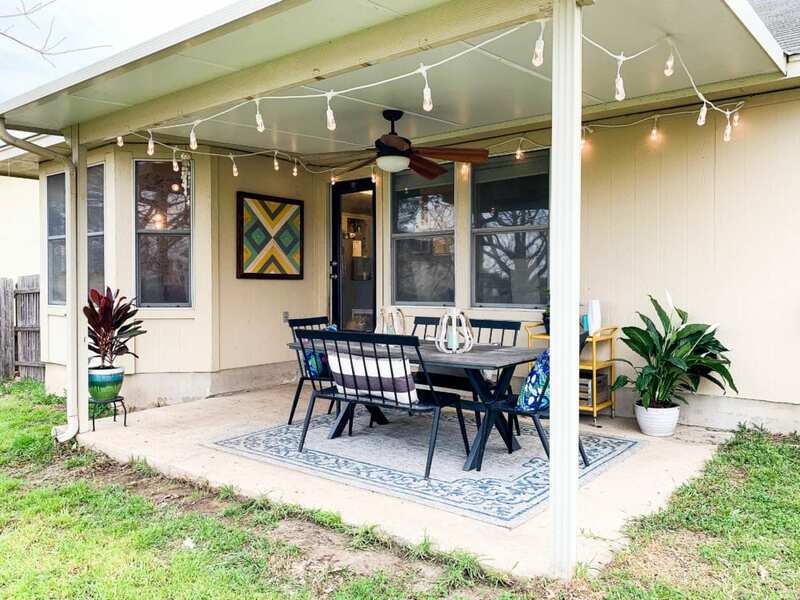 A few weeks back, I mentioned that one of my goals this year is to actually get my outdoor areas whipped into shape and a little cozier for our family. If you’ve been here for any length of time, you’ll know this is a declaration that I make almost every single year. Apparently I really like the idea of having a nice yard in theory, but my follow-through skills are, um, lacking. 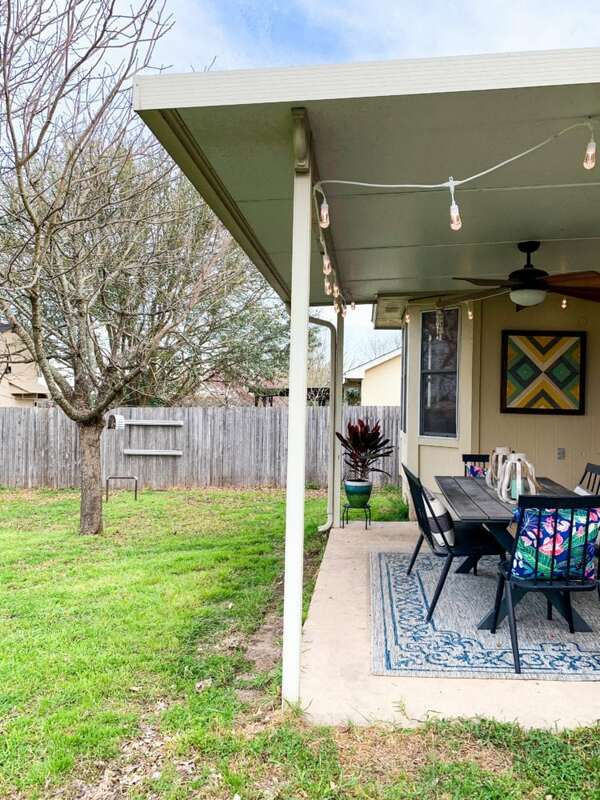 But, we really do have a great little backyard and patio at this house, and I really would love to get it to a point where we can enjoy it a little more – Jackson loves to play outside but as things stand, Corey and I don’t love joining him back there. I’m determined to change that! 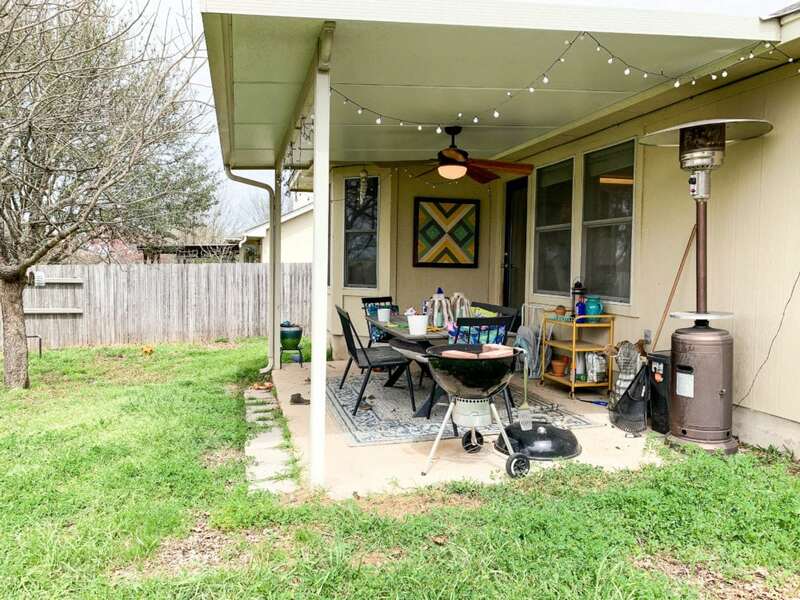 So, once we took care of a few preliminary things (like giving the yard the first mow of the season and cleaning up some leaves), it was time to turn our attention to our back patio. 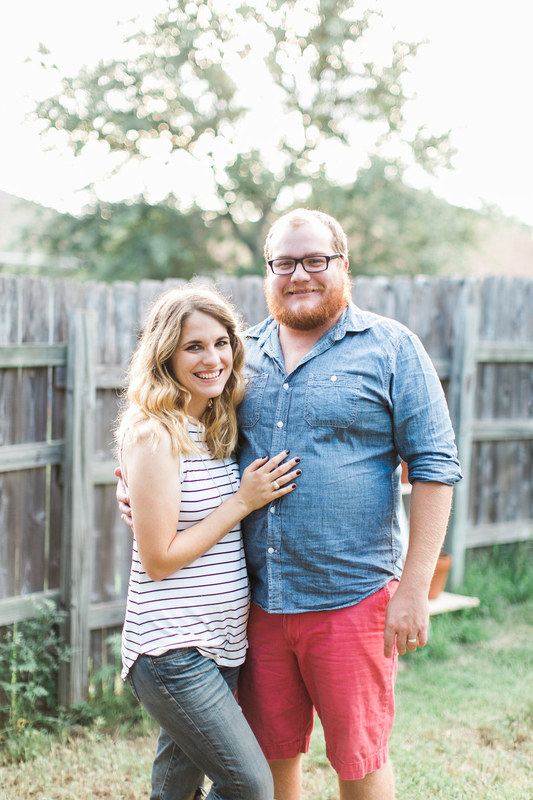 We were so excited about it when we moved into this house – a covered patio is almost essential in Texas! – but we haven’t made the most of it yet. So, last weekend I decided to get out there and clean things up, plus add a few key pieces to make the space feel a little cozier until we’re ready to make some actual changes. It’s wasn’t terrible, but it certainly wasn’t a spot we actually wanted to spend any time. Our main problem (aside from the thin layer of dust on everything thanks to the construction happening behind our house) was that it had become a gathering spot for clutter and it just didn’t feel like a space we wanted to hang out in. I knew I could make a big impact with just a couple of tiny changes, so I started by removing as much of the excess as possible and giving the whole thing a power wash. If you want to make yourself feel better about any outdoor space, I always suggest starting with power washing it. Not only is it probably the most fun you’ll never have, it’s incredible how much cleaner things will look and feel afterwards! After clean up, I swapped out the old, sad string lights for some Enbrighten Color Changing Cafe Lights. 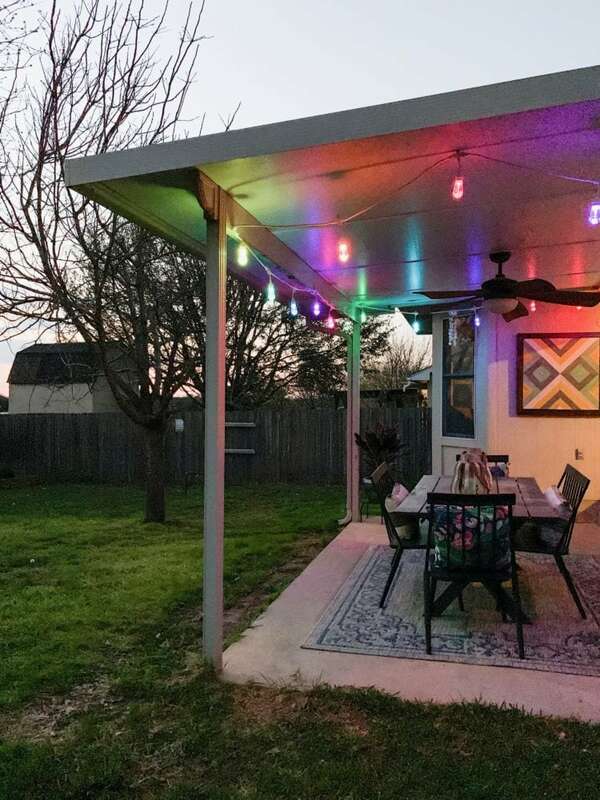 I always loved the idea of having some cafe lights out on the back patio, but I literally don’t think we had ever turned out the ones that were out there. They didn’t give off much light (and, in turn, didn’t give any ambience to the space), and it just felt annoying to go outside and plug them in when we weren’t even spending time out there. The Enbrighten Seasons Cafe Lights, though? 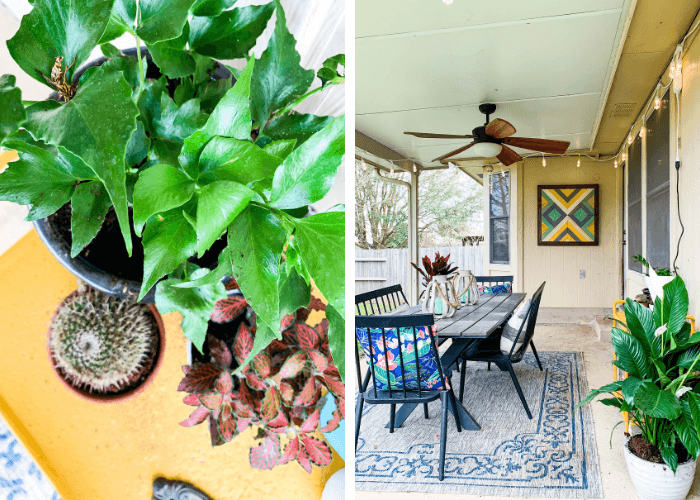 We’ve used them every day since we put them up – even if we aren’t going outside! 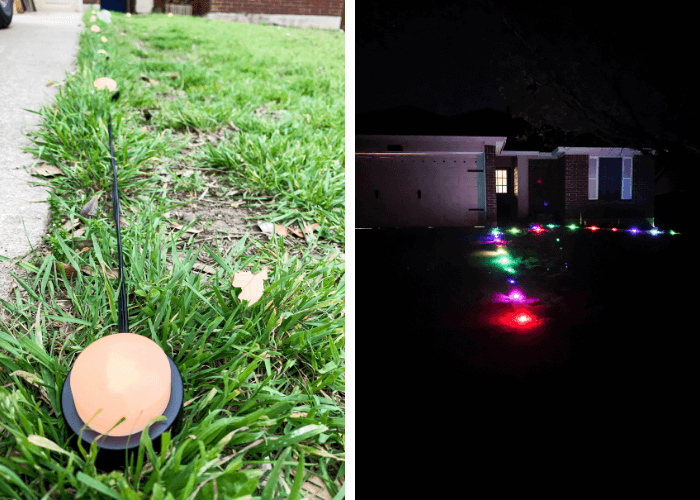 Now, this is the most nerdy you’ll ever hear me get about something like outdoor lighting, but these things are kind of life-changing. They’re controlled by a remote, (!) and have approximately a million (or, you know, just over 120 which is close enough!) customization options so you can change them to just about any color you want. Jackson loves to use the strobe effect, where all of the lights fade in and out to different colors. I like the plain white because I can customize it the perfect color temperature and it’s never too yellow or too blue, and I can also dim them to create that cozy vibe I’ve been lacking. Corey was more than a little excited to learn he could make the lights alternate blue and white so during football season he can make the entire house cheer on his beloved Cowboys. Basically, there’s an option for all of us. The Edison-style bulbs are acrylic (not glass!) so when the wind blows them down or I drop them when I am installing them – which definitely happened – they won’t break. Corey even accidentally drove over one of the landscape puck lights we installed in the front (more on that in a second) and it didn’t break! The lights come in a few different lengths and are also linkable up to 750 feet, so if you have a bigger space than we do, they still work! In addition to the cozy new lights, I added a few more plants out here, because every space is improved by new plants, no? Jackson has already named them all after his favorite My Little Pony characters, so things have gotten personal. Let’s hope I can keep them alive. 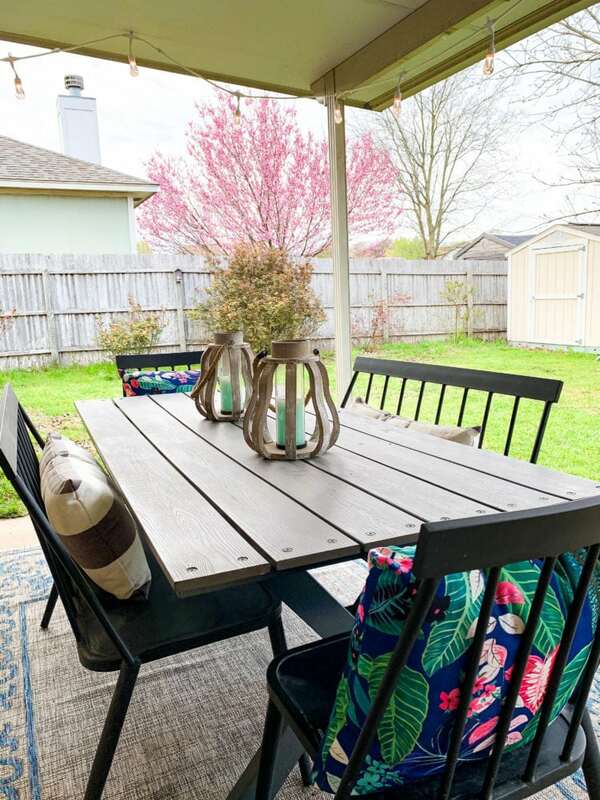 The patio is still far from perfect, but I find myself gravitating to it a bit more already, and I think if we can swap out the dining table for a comfy seating arrangement we’ll be even more likely to use it. In addition to the Enbrighten Seasons Cafe Lights, I also went ahead and added some Enbrighten Seasons Mini Landscape Lights to the front. They have the same customization options (and can be controlled by the same remote, thank goodness! ), and have totally transformed the front of our house. I know it sounds dramatic, but I’m very serious. The light on our front stoop is pretty pathetic and gives off almost no light, and there are no flood lights on our garage at all. So, the tiny little light by our front door is the only thing lighting up our home at night, and it doesn’t do our house any favors. These lights give off a surprising amount of light and are perfect for our too-dark front yard. It was incredibly easy to install them (I just added the included stakes and pushed them in the ground) and they’re super versatile – it’ll be really easy to transition them to a new home when we move. I love to turn them on at dusk and just set the timer so I know they’ll turn off later and I won’t have to think about it again. Our outdoor areas still have a ways to go, but making a couple of small changes like this go a long way towards helping things look nicer. Next on my list is taking care of our falling-apart back fence, cleaning up some weeds, and hopefully painting the house in a few months! I’ll keep you updated throughout the season as we make a few small (and big) changes outdoors – hopefully if we just take it one step at a time, by the time summer rolls around we’ll have a whole new space! 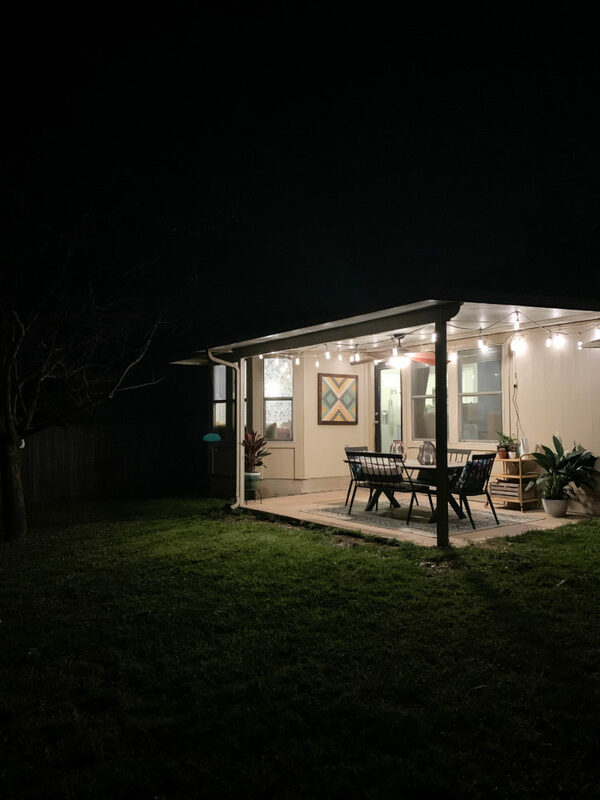 I highly encourage you to check out Enbrighten Seasons Color Changing Cafe Lights & Mini Landscape Lights – it’s an easy way to add some serious mood lighting to your space, and if you’re anything like us it’ll get you using it way more too! The lights look fantastic and are just what I am looking for! Thanks! I really do highly recommend them – they’re really great!